At its best, economics is a fruitful dialogue between theory and empirical (data) work. All economic models are, by nature, simplifications. One of the judgments we have to make is whether some of the simplifcations we've made are inappropriate. Testing our models against the data helps us do that. (the equilibrium wage and quantity of labor are labelled with superscript e's, and the m's mark the minimum wage and corresponding amount of labor). [B]ecause workers are people, wages are not, in fact, like the price of butter, and how much workers are paid depends as much on social forces and political power as it does on simple supply and demand. Indeed, some empirical research has demonstrated that minimum wages do not have the effects implied by the supply and demand framework. This NYT Magazine piece by Annie Lowrey summarized David Card and Alan Krueger's classic paper on the subject and some of the subsequent dispute. A nice bit of parody, "Every TV News Report on the Economy in One"
There is much to agree with in the case he makes for liberal education, but the way he (and the Post's headline writers) frame it is problematic. We don't face a tension between science, engineering and mathematics and liberal education; science and mathematics are part of liberal education, and engineering should be too. Zakaria is right that liberal education is concerned with "critical thinking and creativity." To be effectual, these require a set of intellectual tools to understand the world around us. Liberal education as it is practiced does fairly well through the humanities and social sciences of expanding students' capacities to think about the human and social world. But the social world is shaped by the physical and biological, the mechanical and computational. And here I worry we aren't doing such a good job - we seem too ready to declare that we're not "math people" (and, it mostly follows from this, not science or engineering people). Doing so early in a child's academic life means that they will later find many areas closed off to them. At the college level, we accommodate this with science for non-scientist courses - every college has its "physics for poets" and "rocks for jocks." Some of them are likely fantastic classes, but there is a worrying asymmetry - we don't seem to feel a need to offer "poetry for physicists" or "social theory for biologists". To some extent, this reflects what we're given - too many of our incoming students have already "tracked" away from serious studies in math and science (or turned off to them). But it raises a question of the seriousness of our commitment to science and math as a real part of liberal education. The importance of science and math in liberal education is not just in knowing "stuff," or "how stuff works" - though I think knowing stuff, and how it works, is often underrated - but in learning other modes of thought which can extend our mental capacities and give us another perspective. While Zakaria picked up on our current STEM-mania (much of which is misguided, even on its own terms), and his column's headline puts science and liberal arts in a false opposition, his real target - a narrow vocationalism - is a valid one. Economic insecurity and the wage premium for college graduates have helped entrench the belief that a college degree is some sort of golden ticket. This is a far too circumscribed view: a good education should enhance one's working life (regardless of how remunerative) - but it should also enrich our lives as citizens and people. That is, it should help us, as Keynes put it, to "live wisely, agreeably and well." We would be better able to do this if we took science and math education a little more seriously. Update (3/31): At Forbes.com, Union College's Chad Orzel has a nice response - "science is essentially human" - to Zakaria's piece. Krugman: Not Down With T.P.P. I’m thumbs down. I don’t think the proposal is likely to be the terrible, worker-destroying pact some progressives assert, but it doesn’t look like a good thing either for the world or for the United States, and you have to wonder why the Obama administration, in particular, would consider devoting any political capital to getting this through. While, as a professor of international economics, I have a vested interest in promoting "globaloney," I think he's right about this. Although international trade certainly has a substantial impact on the US economy, the effects of these trade agreements are pretty marginal. Either this deal happens on American terms or an alternative deal arises on Chinese terms without our participation. For rather significant foreign policy reasons, we prefer the former and the pragmatic side of President Obama understands this pretty well. Paul Krugman says that the potential net gains from freer trade in services and (secondarily) agriculture as estimated by Petri, Plummer and Zhai of 0.5% of GDP “seem high to him”. Suppose that they are half that. In a Pacific region whose GDP is now approaching $30 trillion/year, that is $75 billion/year. Capitalize that at 4%/year and we get a net addition to world wealth of $3 trillion. That is indeed a very small number relative to the wealth of the world both now and discounted into the future. But that is a rather large number compared to other things the U.S. government might do this year. So why not grab for it? Update (3/12): At the Washington Post, Autor, Dorn and Hanson argue for the TPP. "Structural reform" means lots of different things - some good and some bad - and whether "austerity" is appropriate depends on the circumstance, so I'm wary of blanket statements about either of those concepts, but I think he is broadly correct in the context of what is going on in Europe right now. The existence of the Euro, in conjunction with ECB policy, prevents necessary monetary and exchange rate adjustments that from taking place, and misguided moralism about debt may make a political settlement impossible. It is this last point which is his target. Economic theory provides a number of useful tools for thinking about tariffs, and these tend to frame economists' instincts when it comes to discussions about "free trade agreements." However, in many cases, tariffs are already quite low (perhaps this is a rare success for economists' powers of persuasion...) and the main ingredients of trade agreements concern other things which are trickier to analyze. One aspect of contemporary trade agreements that is coming under scrutiny in the discussions over the Transatlantic Trade and Investment Partnership (TTIP) and the Trans-Pacific Partnership (TPP) are provisions to protect foreign investors by allowing them to take disputes with governments to arbitration. This Vox piece by Danielle Kurtzleben is a nice summary of the debate concerning these investor-state dispute settlement (ISDS) rules. Another issue getting considerable attention in the TPP discussions is the fact that trade agreements typically do not deal with currencies. As the Times reported, many in Congress are pushing for incorporating a provision to deal with "currency manipulation" into the TPP. 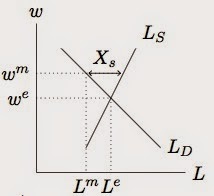 This is a tricky issue which cuts across economics' division between international trade - which uses microeconomic theory to analyze long-run equilibria - and open-economy macroeconomics, which is concerned with monetary and balance of payments issues (which are "short-run" but can have meaningfully persistent effects). At an institutional level, trade policy is usually the purview of trade ministers (e.g., the US Trade Representative), while currency policy falls to central banks and finance ministers (i.e., the Treasury in the US). Globally, trade has the WTO, while currencies have the IMF (which, unlike the WTO, does not have any enforcement mechanisms). Simon Johnson and Jared Bernstein have written in favor of inserting a currency clause, while Edwin Truman argues the contrary. Janet Yellen expressed concern about the potential for trade agreements to encroach on monetary policy, and Jeffrey Frankel noted that some of the loudest concerns about currency manipulation aimed at China (not currently a party to the TPP) are out of date.